There’s nothing like a handmade gift for a loved one during the holidays. Or any time, for that matter! I got started making DIY bath and body care items totally by accident. I had stumbled upon a tutorial for homemade lotion bars on Pinterest, and I was so taken with how luxurious they seemed I knew I had to try making some for myself. That Christmas, I made all my aunts and cousins homemade soap, sugar scrubs, and lotion bars and let me tell you: they were a hit. And ever since then, I’ve been convinced that DIY bath & body care items are the perfect gift for moms, grandmas, aunts, cousins, girlfriends, neighbors, coworkers, and even the man in your life who appreciates being pampered once in a while. If you’re looking for a thoughtful handmade gift for a loved one this year, or a gift that’s easy and affordable to make in bulk (think bridal or baby shower favors! ), look no further! 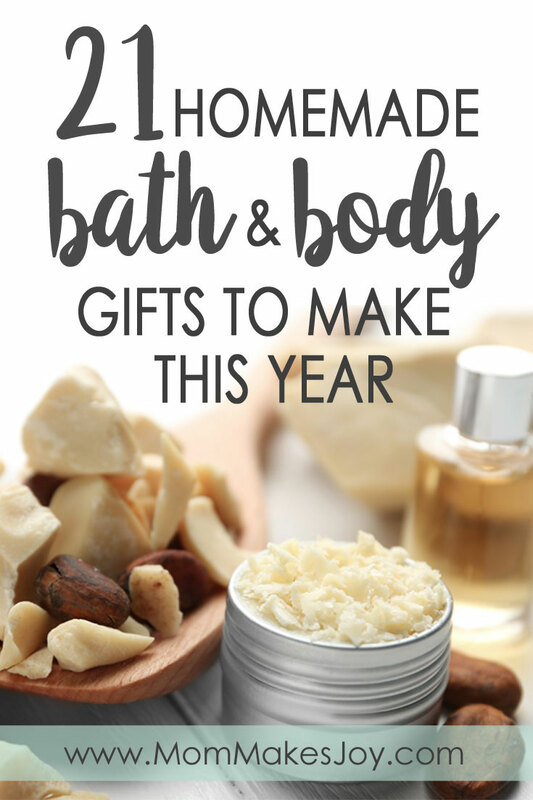 I’ve been sharing DIY bath and body items on my blog for a few years now, so here is a collection of some of my favorite past projects that make for great gifts. If you’re allergic to any of these butters or oils, no worries! Candelilla (vegan) wax can often be substituted for beeswax, and liquid oils can be swapped with other liquid oils (e.g. jojoba or grape seed oil for almond oil). Shea butter can usually be swapped with another soft butter like mango butter, and cocoa butter can usually be swapped with another hard butter like kokum butter. Click the DIY recipe below to go to the original blog post, which explains exactly what ingredients you need and where you can find more detailed instructions! For your convenience, main ingredients needed for each recipe are listed. My second most popular soap recipe! This soap smells like Island Coconut (a Brambleberry fragrance) and is exfoliating because it contains a hidden loofah sponge inside! If you love citrus, this orange zest lemon soap is the recipe for you. It contains orange zest (optional) suspended inside and has a beautiful lemon scent. Summer in a bar of soap! Ever since becoming something of a crunchy mama, I’ve shied away from mainstream shampoos. This organic lemon coconut shampoo is made with a base that is free of sulfates, SLS, SLES and parabens! This Jasmine Dead Sea salt soap and sugar scrub was actually so close to being a total flop! Check out the tutorial to see where I almost went wrong and how awesome it turned out in spite of my initial mistake. Fall time means pumpkin spice everything. So why not pumpkin spice soap? 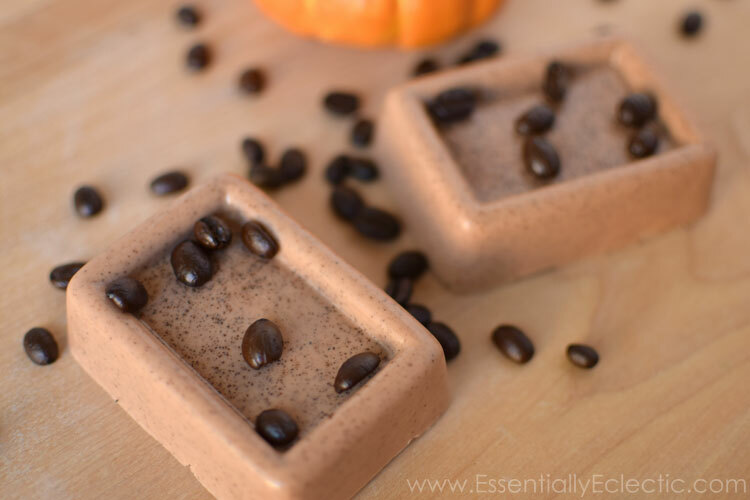 This pumpkin spice latte soap is made with ground coffee beans and smells like coffee and fall in your shower. If you love sugar scrubs, you’re about to love whipped sugar scrubs even more. This whipped chocolate sugar scrub feels amazing and is only a few simple ingredients! To make this peppermint cocoa lip balm, you’ll need to melt down your ingredients in a double boiler. 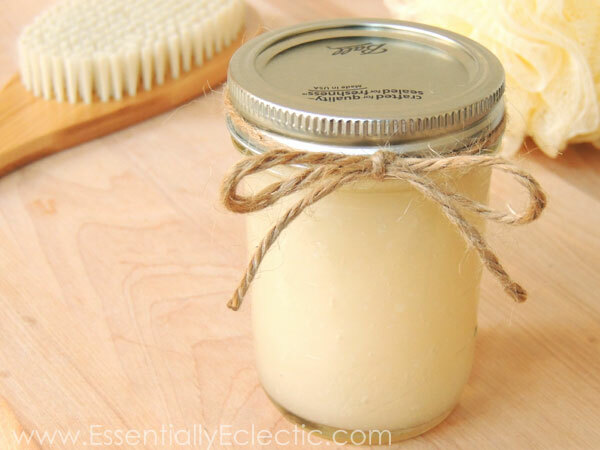 This was another one of my first DIY bath and body projects and is a perennial favorite! It gets its chocolate scent from the natural cocoa butter. Make it in bulk and use it for months! This soap is a little different from the others because it calls for rebatch soap base, which is similar to melt-and-pour soap base but with a little twist! To make this cinnamon hazelnut coffee soap, you’ll need to melt down your soap base in a double boiler for best results. I highly recommend the milk and honey fragrance oil from Brambleberry for this one! Shower jellies are a DIY soap your kids will LOVE. This clear, wiggly soap feels like jello in your hands and will need to be melted down in a double boiler for best results. Check out the blog post for a short video that shows how the finished product wiggles! Ah, lotion bars! These are excellent for dry, cracked heels and rough hands and elbows. Some even swear by lotion bars for eczema! Add a fragrance oil of your choice, or leave them plain. These are great for anyone with dry skin–men included! This is another project for which you will need a double boiler. I just want to eat these soap bars up! 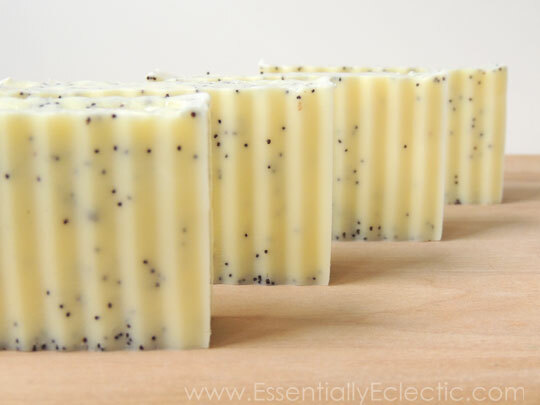 This lemon poppy seed triple butter soap is exfoliating and reminds me of lemon poppy seed muffin batter. Consider using a soap base that is designed to keep additives suspended in the soap for best results. This all natural dark chocolate soap is made from a soap base that contains no surfactants, mono propylene glycol, parabens, phenoxyethanol, or sulfates and is PEG free and vegetable based! Mix in a chocolate fragrance oil and you will have some soap bars that look good enough to eat (but…don’t eat them). Shea butter and oatmeal are incredibly healing for this skin, and they complement each other beautifully in this shea butter and oatmeal confetti soap! 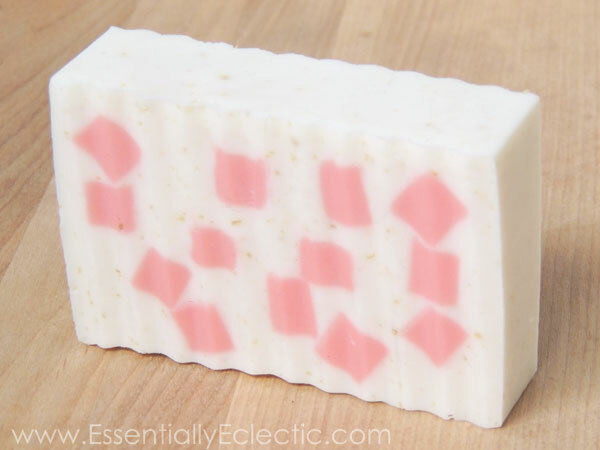 Check out the blog post to see how I made my own soap inserts to create the pink confetti squares. When you make this lavender and lemon oatmeal mud mask powder, be sure to avoid stirring it with a metal spoon! Check out the blog post to find out why, as well as learn about the healing properties of the main ingredient: clay. Another whipped sugar scrub that is sure to delight! This whipped mint green tea sugar scrub is a favorite of mine to use in the tub after a long workout or hard day. The mint is relaxing and the scrub is decadent! Did you know that vanilla-based fragrance oils can discolor your soap? That doesn’t usually bother me, because I like the natural look of a light brown soap and often pair it with a coffee or chocolate fragrance anyway. But if you don’t want your soap to discolor, then be sure to check out the vanilla stabilizing soap base featured in my golden honeysuckle soap bars! This was my first attempt at using dried botanicals in my soap, and I think it turned out pretty well! This carrot, cucumber and aloe soap has a rich, naturally orange color from the beta-carotene found in the carrot. These spooky skull soaps are actually super easy to make with the right molds and some careful timing. See how I made them in this blog post! You can check out another spooky Halloween soap I made here. A natural follow-up from my Halloween soap, this Christmas tree soap is perfect for stocking stuffers or a gift for coworkers! These cute gingerbread man soaps are made from African Black soap base, derived from real raw African Black Soap from Ghana. Learn more about this amazing soap base and how to make these adorable gingerbread men here! What DIY bath & body recipe will you be trying this year? Let me know in the comments! Oh I’m so glad you posted this. I always need a “cheap” gift to give people like my doctor or the mailcarrier and I could do a lot of these even though I’m not very crafty!